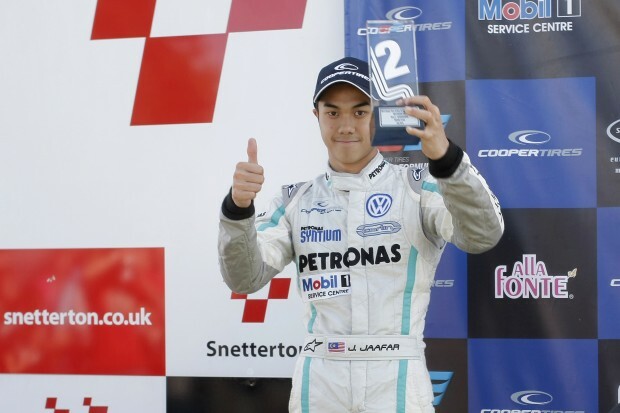 Jazeman Jaafar secured his tenth podium of the 2012 British F3 International Series at Snetterton, Norfolk, this weekend. In the first race torrential rain forced a red flap stoppage with Jazeman finishing seventh. The second race produced a second place podium for the young Malaysian and with more rain affecting the third race, Jaafar finished in fifth place. His strong points finish kept him in the Drivers’ Championship title hunt, with Jaafar maintaining third position. The early weekend practice sessions were an opportunity for Jaafar to develop the car set up for the races ahead and he worked with his engineer to plan their strategy. With a pace which placed him fourth overall after these sessions Jaafar was ready to do battle on track once again. The qualifying session proved very competitive as always and Jaafar produced laps to put him fourth on the grid for the first race and sixth for the third race, with the semi-reversed grid placings for the second race set to be taken from the results of the opening race. The first race, held on Saturday afternoon, started on a wet track after an earlier torrential rainstorm. Jaafar had a flying start off the grid to be lying second in the second corner, but his hopes of a podium finish were instantly wiped out when rival, Harry Tincknell, slid into him, spinning him round and dropping him to 11th position at the end of lap one. Jaafar, never one to give up on a points finish, was quickly hunting down the drivers ahead, picking them off lap by lap to lie in seventh place when another heavy rainstorm brought the race to an abrupt, premature end. The PETRONAS Talent Programme driver started Sunday morning’s race in sixth place and had another strong start to lie third after the first lap and then making a move on Richard Goddard to claim second position, behind Carlin team mate Harry Tincknell. Once past Goddard Jaafar turned a series of quick laps to close up on Tincknell, posting fastest lap of the race, and an extra championship point, on route to his podium finish. The final race of the weekend started after another storm and with a rain-soaked track visibility was poor and opportunities for overtaking very limited. Jaafar drove a strong race from sixth place to finish fifth at the chequered flag, claiming more championship points to keep him in third place overall in the championship. Jaafar summed up his weekend saying, “I was very disappointed with the outcome of the first race as I’d had such a good start and had my eye on a podium, but it didn’t work out that way. It was a shame the rain stopped the race, but it was the right call as the track was just becoming a river and too dangerous. Taking the podium in the second race was very important as I couldn’t afford to lose out on any more points and I was pleased to bounce back with that finish. The third race was another solid points finish and these three finishes have keep me in the hunt for the title. Jaafar’s next race weekend will be 18-19th September at Nurburgring, Germany in the F3 Euro Series.